colors, such as Cobalt, Tomato, Pumpkin and Clover (shown). I’ve gone through a lot of headphones in my time (mostly because I lose them so often). And though I’ve bought many types – in-ear, over-the-ear, cheap, expensive, wireless, you name it – they’ve all shared on thing in common: Headphones get dirty. Surprisingly dirty. 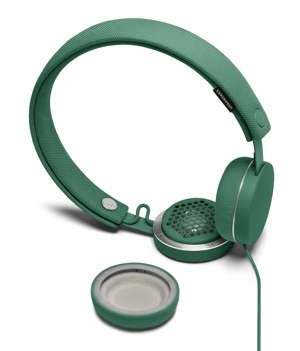 A company from Sweden named Urbanears has come up with a solution to this problem: washable headphones. That’s right – the colorful ear cushions and headband of its new over-the-ear Humlan headphones are removable and machine washable. Goodbye dirt, goodbye workout sweat. That’s not the only notable feature on the Humlan. You’ll also find a ZoundPlug, which allows the connection of a microphone for hands-free mobile calling or even a second pair of headphones for music sharing. Its presence makes a nice bonus, especially if you have kids who like to share their music. A pair of Humlans retail for $49 at urbanears.com and start at $45 on Amazon, so you know right off the bat that you’re not going to get a top-tier listening experience like you would with a pricer set of high-fashion headphones. These headphones are best suited for someone who cares more about style, wearability, affordability and cleanliness than top-precision sound. For more information on how to pick out the right pair, check out Techlicious's How to Buy Headphones guide.